Unlike here in the US, they still seam to be ploughing in Europe! Is all of your land so well developed it doesn't require a mixing of surface applied materials throughout the soil profile? We provide Kverneland ploughs if that isn't the case! We caution all regarding where the earthworm is in the soil profile with any and all tillage operations and suggest you check soil profiles before engaging in any tillage! Before we get started, let us define what we sell at PleasantCreekHayEqipment.com, we sell tractors with front PTO and FRONT 3 POINT HITCH! What made the Ford 8N a success? It used the plows lifting force to provide balast to an otherwise light weight tractor. This feature also lifts the plough creating less drag and HP/ acre poughed, making a more efficient plough!. It reduces soil compaction and less of a plough pan! We are dedicated to introducing the Front mounted plow to North America. 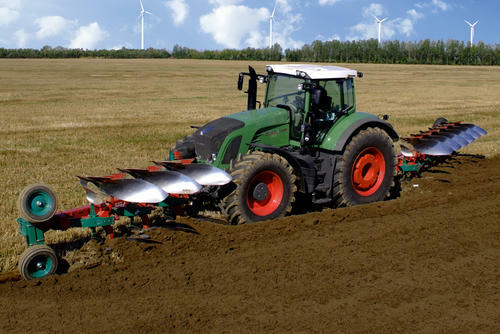 The lack of available Kverneland front ploughs in Europe though is such that here in the North East we are recommending http://www.cummingsandbricker.com/TILLAGE.pdf and their network of dealers! Via our European contacts, we will find a way to do a Role On Roll Off of tractor and IMPLEMENT and be able to deliver the mower and/or rear rollover plow of your choice. We specialize in finding Kverneland used rollover plows for our partners and their (our) partnerships. What I want to point out though is that it was done in part with a front plow and that in recent years not a single 24 hour ploughing record has been won without the use of a front plough!! We've decided to spend a considerable time building a web page dedicated to a rather minor portion of our business in exchange for very infrequent updates in the future. We'll try our best to explain through example the different features of the Kverneland Plough!!! Just for further clarification, we at PleasantCreekHayEquipment.com are dedicated to making the plough... and your tractor the most efficient plough you can buy! New Kverneland roll over ploughs are fully mounted up to 7 bottoms and roll over the head stock. On review older ploughs show these same characteristics. New semi-mounted ploughs of 7 bottoms or more roll over a second frame and do not roll over the headstock! Do not be deceived with the transport wheel often found in ploughs of 5-7 bottoms THESE ARE FULLY MOUNTED PLOUGHS! In addition we have listed the Big Trailered ploughs that can take advantage of big HP tractors. KVERNELAND OFFERS A SHEAR BOLT PLOUGH! WE LIST NONE OF THOSE PLOUGHS, PREFERING A HAPPY WITH THE PLOUGH OWNER! We've changed our format, listing in ascending order Mounted Ploughs between 5-7 bottoms in increasing complexity. then trailer ploughs between 8-14 bottoms. Note particularly that this fixed width plow is bolted together section to section. ES series......ES ploughs lack memory and have to be readjusted to the tractors width with the tractors hydraulics after the roll over. EG and EO series ploughs can be expanded. Kverneland makes 3-7 bottom mounted ploughs. Used 7's are not that common. At times we have gone several months without an entry. Efficiency! We like Plasic Moldboards and think they are slicker than steel and are at least recommending a trial, but not necessarily a plough with them on. We think it possibe striped moldboards with 1/3 the surface area might be just as efficient if not more so! The "85" plough! Each plough being 18-20% closer to the rear axle, 6-10% more efficient? We think so, but you should realize the clearance less and heavy stalks might PLUG the plough! Fixed width Great Plough......Particularly when used in conjunction with or without a front plough, quite a few dollars less than a variable width plough! The front plough though,makes this plough shine as we can when the going gets tough plow with just the rear 5 or if the going gets even tougher plough with just the front! WE ARE OF THE CONTENTION THAT OUR FRONT PLOUGH ELIMINATES THE NEED OF THE MORE EXPENSIVE "FANCY" VARIABLE WIDTH PLOUGH and Dollar for dollar if we don't commit to ploughing for round the clock ploughing months at a time the less expensve fixed width plough may be the best investment. More 5 Bottom MOUNTED,VARIABLE WIDTH PLOUGHS! Not our favorite Plough! For efficiency, with a mounted 6 bottom plough! Semi Mounted 6's, 7's & 8's? ,10's? Not our favorite Plough! For efficiency, we'd rather plough at a faster speed with a mounted 6 bottom plough, preferably a mounted 7 bottom! Or go to a bigger 7 bottom trailer plough or beyond and if you really want ploughing efficiency, PleasantCreekhayEquipment.com makes the promise that with demand we will build you a super plough, the trailer using hydrostatic drives also taking advantage of the ballasting characteristics of the plough to do 50% of the pulling requirements ot the last half of the ploughs! We may never build a super plough, but without an inventory of trailer ploughs, we most assuredly won't!!!! A 240 HP tractor with 3 front ploughs, 6 centered and 3 in the rear would require 60 HP of drive!